Condition: Very good condition. See ALL photos for details. Big and Tall Size XL. Great condition unique design but the button of the shirt is curling up a bit as you can see in photos. ~Blue and ivory palm tree design. ~Length from shoulder to hem: 32". 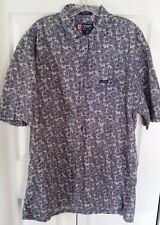 Chaps Men's Chamois Work Shirt Size Large Tall 100% Cotton Armpit to armpit: 24" Length from shoulder to base: 34" Sleeve: 27" Very good condition with no rips or stains I ship via USPS with tracking. Your package will be shipped out within 2 days of receiving cleared payment. I also will leave you positive feedback immediately after payment. Thank you! Red Blue Navy White Plaid 60 % Cotton 40% Polyester. Large Tall. Large Tall. Green Blue Navy Red White Plaid 60 % Cotton 40% Polyester. Red Green Blue Black Plaid 60 % Cotton 40% Polyester. Large Tall. COLOR: Orange MU. SIZE: LT Big and Tall Large. MATERIAL: 60% Cotton 40% Polyester. NWT Chaps Men's Shirt LT Long Sleeve Button Down Cotton Blend Checkered. Pink, blue, white, black Checks. Collar to hem 35”. Blue Red Black White Plaid 60 % Cotton 40% Polyester. Oranges Red Blue Navy Black White Plaid 60% Cotton 40% Polyester. Blue Red Royal blue White Plaid 60% Cotton 40% Polyester. Blue Orange Green T an B lack White Plaids 60% Cotton 40% Polyester. Navy Green White Plaid 60% Cotton 40% Polyester. Large Tall. Red Black Green Plaid 60% Cotton 40% Polyester. Large Tall. Note: Blue is not as bold. Navy Green White Blue Plaid 60% Cotton 40% Polyester. Large Tall. Blue G reen Y ellow Black White Plaid 60 % Cotton 40% Polyester. Long Sleeved. Easy Care Stretch. Machine Washable. Color may not be exact - computer monitors are not uniform - colors look a little different on my tablet than on my larger regular monitor. 34" long 25" armpit to armpit.